Don't cover your glass: Frame it! The FixLogix SEE Frame Fixture system for video inspection systems is the clear alternative to expensive acrylic grid plate systems. Designed by vision experts: the SEE Frame fixture design is the result of over 24 years of direct experience in the vision metrology field. Several years of field testing preceded this product launch. 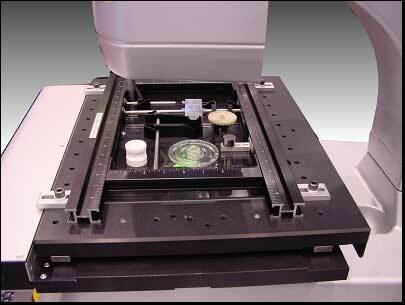 Video CMMs are designed with an optical quality glass stage on which to mount parts. It follows that best practice is to fixture the parts on the glass surface whenever possible. The SEE Frame is designed to work with the glass stage of Video CMMs... not obscure it! The system features laser engraved linear framing with the FixLogix t-slot system for easy repeat setups. A new t-nut 2-axis mounting system provides an easy retrofit to a wide variety of popular Optical CMM models and sizes. FixLogix components introduce new technology. Our patent-pending self-wedging clamps offer near zero clamping force. Sliding t-nut tooling blocks provide an infinite variety of fixture solutions. Even the corner-joiners for our frame are dual purpose, providing ridges that allow backlighting to pass through for edge inspection. Fixtures for vision inspection are often application specific. The SEE Frame acts as a flexible delivery system, to position locating components where you need them. If you have an application requiring a custom component set, we will be pleased to work with you to devise an optimal fixture solution. Below is an example of a simple 4 station fixture on a single linear frame. The fixture uses ridged corner locaters and spring-plungers. 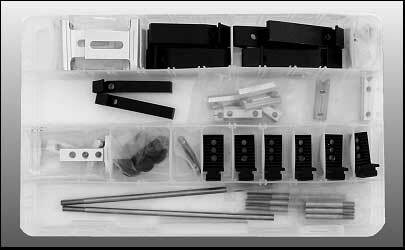 The component kit below is included with the SEE Frame fixture system. Stainless clamp rods and frame are matched to the specific machine size.